On the trip to Malta that I wrote about last week, we spent one day on Gozo, the country’s second largest island. More rural than the eponymous main island, Gozo has its own full share of marvels, from megalithic to medieval, as well as lovely rolling hills and excellent traditional food. A highlight of the day for Tom and me was lunch made by the noted Gozo chef George Borg – a lunch made not just for us but partly by us. This was a fun occasion as well as a delicious one. George is a delightful man and a very talented chef, passionate about Maltese culinary traditions, as well as about wine. 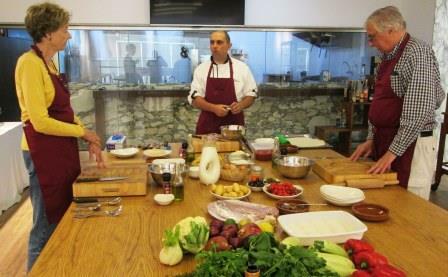 When we arrived at his studio kitchen, he had work stations and aprons set out for us; and he started us right off at helping to prepare the antipasto course: his own Gozo-style ftira. Now, the ftira we had in Valletta, as I showed last week, was on a thick base of bread, hence fairly heavy for an antipasto. George’s version lightens it by using flaky butter pastry. We were intrigued. 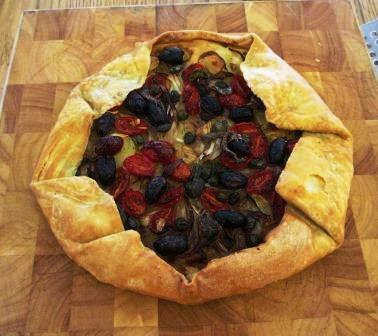 The topping we made that day was potatoes, onions, tomatoes, olives, capers, garlic, and anchovies. I thinly sliced potatoes, Tom halved grape tomatoes, and George did the rest. While the ftira was baking, we moved on to preparing the next course, which was to be stuffed baked pasta shells. For the filling I mashed several little cheeselets – Malta’s ubiquitous fresh sheep cheese – with grated pecorino, chopped parsley, and black pepper. Then, in the the most unusual way of treating pasta I’ve ever encountered, George gave Tom and me each a pastry tube filled with the cheese mixture and a pile of pasta shells to be filled with it – raw shells. 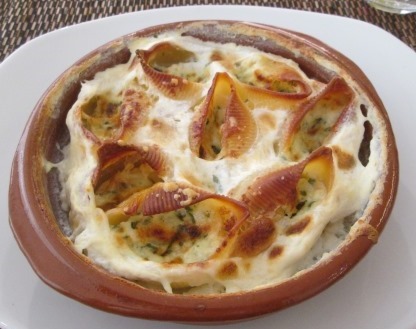 Once stuffed, the shells went into gratin dishes. George poured on milk to come half way up the pasta, sprinkled the dishes generously with grated pecorino, and put them in the oven to bake with the ftira. 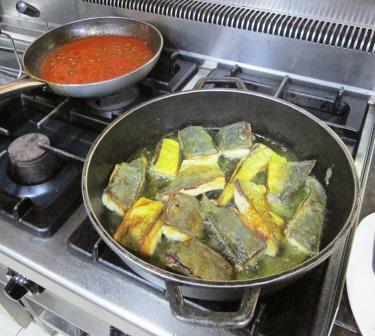 Next, George brought out the fish that was to be our main course: fillets of lampuki. This autumn-season specialty is Malta’s favorite fish. Elsewhere, it’s called dorado, dolphin fish, or mahi mahi. But the ones caught here are nothing like the huge, bull-headed, pastel-hued creatures we in the US know as mahi mahi. 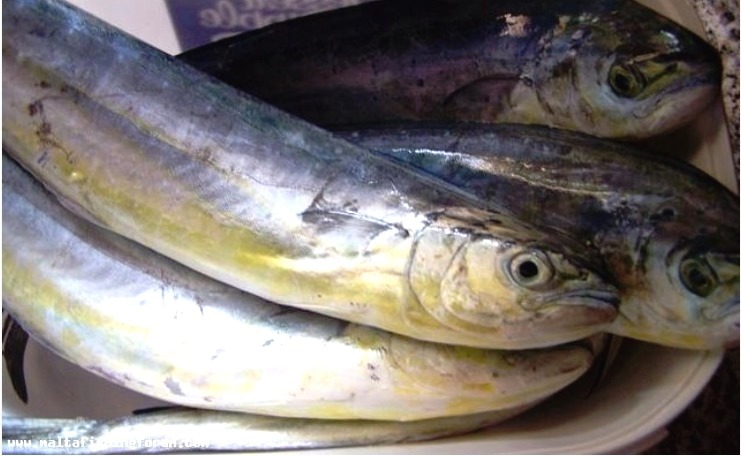 The lampuki we saw in Malta’s fish markets were small, slender, silvery, white-fleshed fish, with no scales. The fillets George cut up were no more than a foot long. He said this was the end of the lampukis’ season, and that was as big as they ever got. To give us an authentic Gozo experience, he cooked them in one of the favorite local ways: just floured, shallow-fried, and served with a tomato sauce. George’s sauce was based on his own sundried purée of tomatoes. (That is, not a purée of sundried tomatoes but a fresh tomato sauce that he’d made, spread out on trays, and left to thicken in the sunshine – much the way it’s done in Sicily.) He stirred salt, sugar, and capers into the purée, then softened chopped garlic in olive oil in a skillet, added the seasoned puree and a good slosh of water, and set it on the stove to simmer. At last we sat to lunch. Our host had opened two local wines for us to choose from: a Vermentino and a Sangiovese. Naturally we tried both! They were very good. 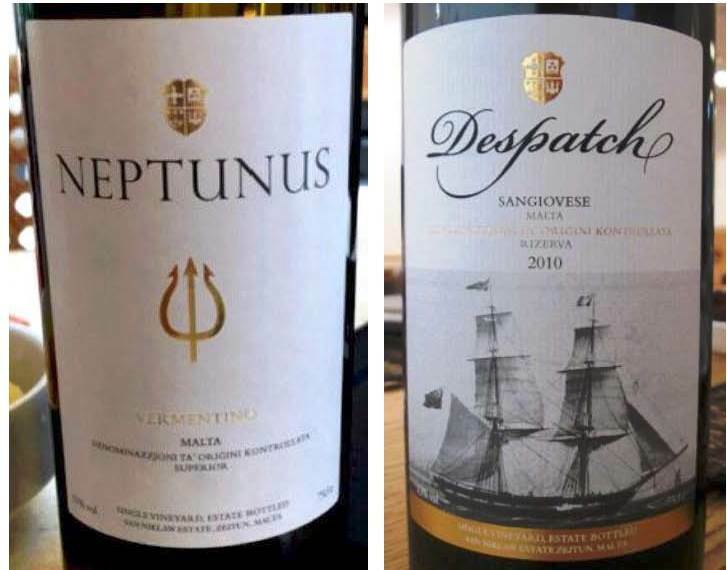 Tom has a blog post on Maltese wines that says more about these two. The ftira was delicious – and quite light, thanks to the crisp, buttery flaky crust. It was hard to resist gobbling it all down, but we knew how much more there was to come. 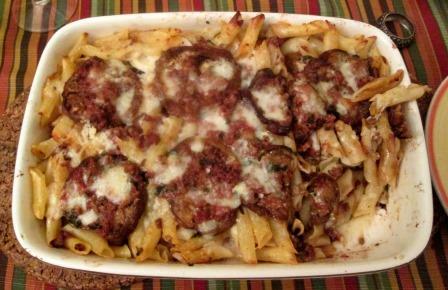 Next came the baked stuffed pasta. The parts of the shells that had been in the milk were soft and fully cooked, while their top edges were firm, brown and crunchy. The milk itself had thickened into a lightly cheese-flavored cream. 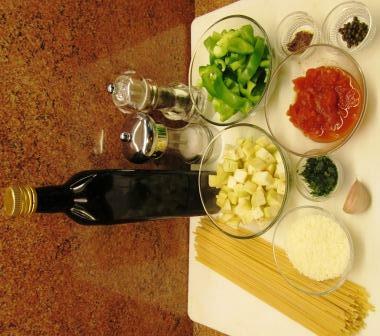 The mix of textures was a bit disconcerting to us – not the way we’re used to dealing with pasta. It tasted fine, but we still haven’t gotten past our sense of its oddness. 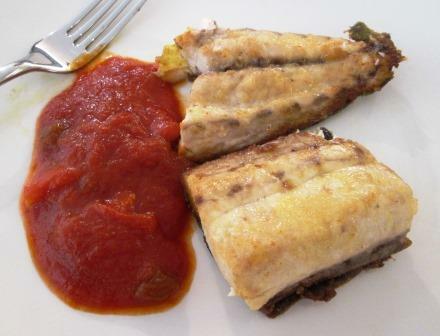 The lampuki was lovely in its simplicity – quite delicate but very flavorful – and the rich tomato sauce made an ideal complement. We relished every bite of the sweet, firm flesh, whose richness was nicely counterpointed by the acidity and brightness of the sauce. George was eager to give us dessert, but after all those good dishes we couldn’t eat another thing. Tiny cups of espresso and glasses of an excellent grappa made a perfect conclusion to this wonderful meal. 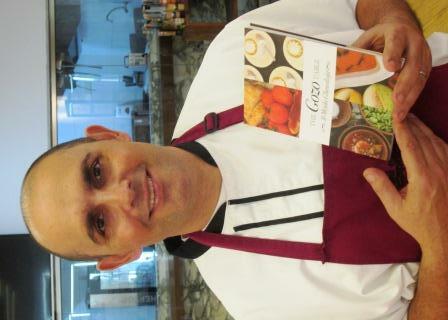 As we departed, with compliments on all sides, George gave us a copy of one of his cookbooks. I’m very much looking forward to trying some of his recipes! The occasional days of unseasonably hot weather we’ve experienced lately have activated my craving for full-summer vegetables. Of course there are no local ones yet, nor will there be for weeks and weeks. Nevertheless, I just had to eat something with eggplant, peppers, and tomatoes. I settled on a suitably summery dish of Spaghetti alla Siracusana, a Sicilian recipe from my first cookbook, La Tavola Italiana. I bought the firmest eggplant and crispest Bell pepper I could find and opened a can of imported San Marzano tomatoes. The seasonings were capers, anchovy, garlic, and parsley (a substitute for fresh basil), along with generous quantities of olive oil and grated pecorino romano cheese. 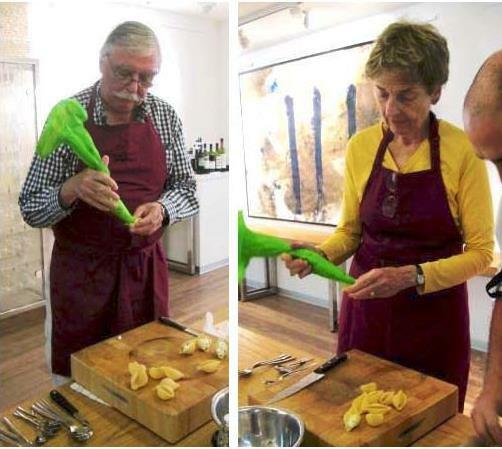 Once the ingredients were prepared, making the sauce was a breeze. I sautéed the diced eggplant, whole garlic clove and chopped anchovy in olive oil for about 7 minutes. 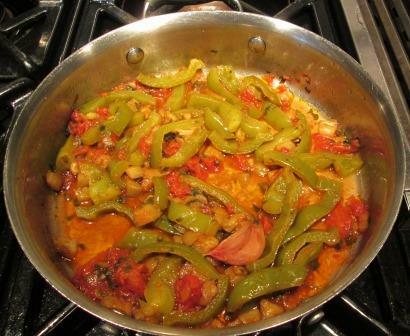 I stirred in the pepper strips, chopped tomato, capers, and parsley; covered the pan; and simmered, stirring occasionally, for about 15 minutes, until the peppers were tender. It seemed a bit dry toward the end, so I added a little water. I took out the garlic, added salt and generous grindings of black pepper, and set the sauce aside until we were ready to eat. 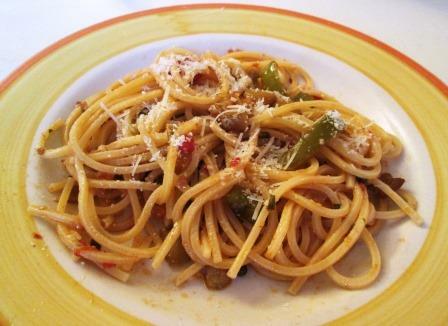 When the spaghetti was cooked, I dressed it with the reheated sauce and half the pecorino. The grated cheese disappeared right into the sauce. As you can see, the pasta wasn’t heavily coated with sauce. It’s not supposed to be. The tomato doesn’t turn into a puree but remains in soft little pieces, as do the eggplant and peppers, adding their textures to each forkful. The olive oil provides all the moisture the dish requires. The rest of the grated cheese went to the dinner table, for each person to add as desired. 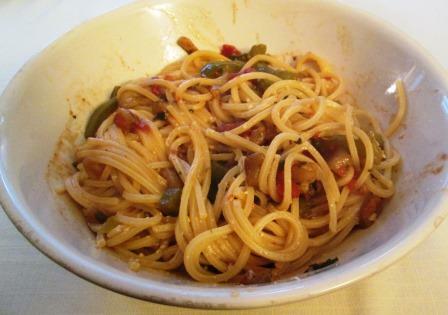 This was an enjoyable pasta, with sweet vegetable flavors and mild nuttiness from the cheese – but sadly, only a ghost of what Spaghetti alla Siracusana can be with fully ripe, newly picked eggplants, peppers, and tomatoes. Good enough to satisfy my pre-season craving, it was an object lesson in why dishes one gets in Italy are often so much more luscious and vibrant than their counterparts in the US. So it wasn’t all I’d hoped for — but it had to do, as the song says, until the real thing comes along. 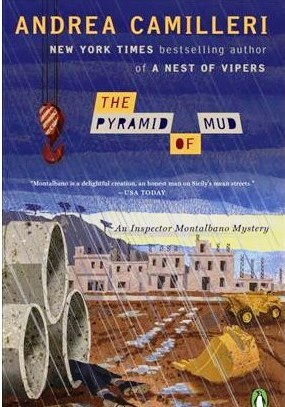 In The Pyramid of Mud, the newest paperback Montalbano mystery to be released in English, it takes only to page 34 to find the intrepid Sicilian police detective regaling himself with one of his favorite things to eat: “a glorious pasta ‘ncasciata” that his housekeeper Adelina had made and left for his dinner. That dish appears in many of the 22 books in the series, always eagerly greeted and blissfully consumed by our hero. A few years ago I wrote here about my attempt to make that fabulous pasta ‘ncasciata, using the recipe in the cookbook I segreti della tavola di Montalbano: Le ricette di Andrea Camilleri. 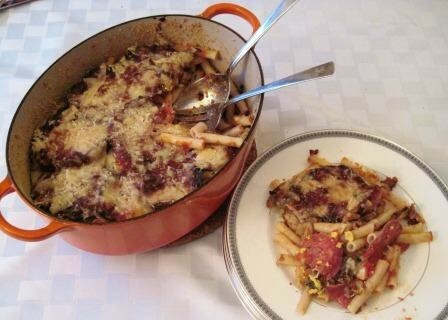 My version was a bit of a disappointment – a decent baked pasta dish, but not extraordinary. I knew that there’s no single, canonical version of pasta ‘ncasciata, but they all should be good. Encountering it again in the new Montalbano story, I felt I should really give the recipe another chance. An occasion for my attempt soon presented itself: We’d invited a few good friends for a casual “family” dinner. These were adventurous eaters who wouldn’t mind being experimented on – at least, not if we also gave them lots of good wine! So I set to work. To start, I peeled, sliced, salted, and fried two one-pound eggplants in olive oil. 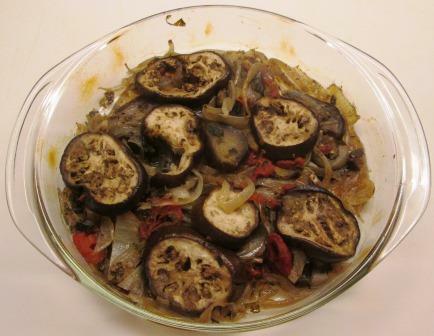 That was more eggplant, more thickly sliced, than I used last time, but the recipe merely says four eggplants, no size or slice thickness given. We like eggplant a lot. Next was to make a tomato-meat sauce. To perk it up, this time I infused garlic and peperoncino in the olive oil for browning my half pound of chopped sirloin. Then I stirred in a pint of my own light tomato sauce, salt, and pepper; and simmered for 25 minutes, until it thickened. That was more tomato and longer cooking than the recipe seems to call for, but its instructions on that point aren’t very clear, and I wanted more tomato richness. Having no fresh basil, I used parsley. I boiled a pound of imported Italian penne until they were not quite done, drained them and sprayed them with cold water to stop the cooking. 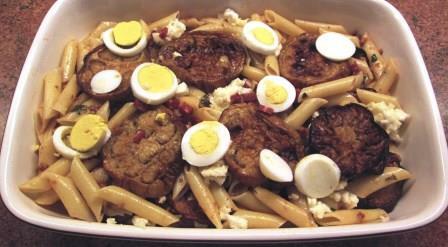 The other ingredients to prepare were two hardboiled eggs, two ounces of mortadella or salame, and two cheeses: caciocavallo and pecorino. Last time I’d used a mild salame; this time I bought a livelier one: hot soppressata. My cheeses were the biggest accommodation to ingredient differences. 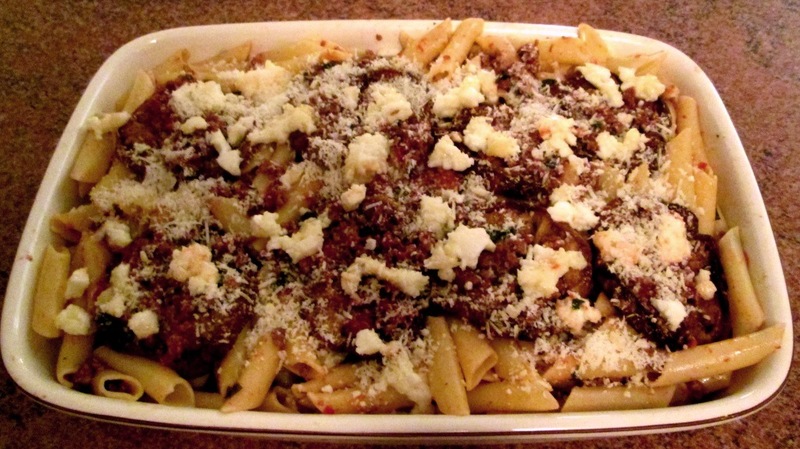 The recipe calls for 7 ounces of tuma or young caciocavallo, plus 3½ ounces of grated pecorino. The only caciocavallo available here is somewhat aged – not soft and fresh, like Sicilian tuma, which isn’t here at all. The first time around, I hadn’t realized how much difference the age would make. 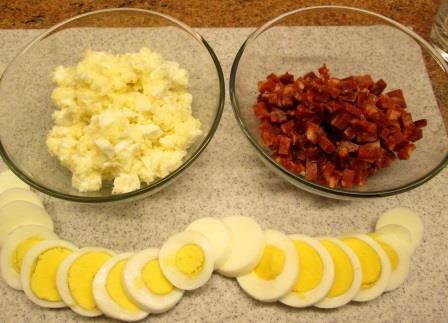 The large amount of strong, dry cheese dominated and sort of flattened the flavors of the other ingredients. I didn’t want that to happen again. Since caciocavallo is in the same broad cheese family as mozzarella (I’ve seen it called “mozzarella on steroids”), I decided to substitute mozzarella for some of the caciocavallo. 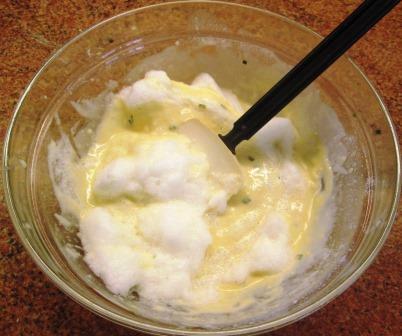 The cheese in the picture above is 4 ounces of chopped mozzarella mixed with 2 ounces of grated caciocavallo. I took a broad, shallow baking dish to assemble the ‘ncasciata, making layers of pasta, meat sauce, eggplant, sliced eggs, diced soppressata, and the cheese mixture. The recipe called for grated pecorino on each layer too, but I left it out this time. The top layer was eggplant, dabs of sauce, the cheese mixture, and just a light sprinkling of grated pecorino. Well, this pasta ‘ncasciata was a definite success. All the flavors stood out as themselves and companioned beautifully with each other. The eggplant was luscious. The two cheeses balanced each other in taste and texture. The amount of tomato seemed just right: it was mostly absorbed by the other ingredients, providing flavor and moisture but no loose liquid. The soppressata tidbits were tiny sparks on the palate. The penne in the center were properly soft, and those at the edges nicely crunchy. All in all, this was a dish I’d be bold enough to serve to Montalbano himself – at least if Adelina wasn’t around. When you’ve got a good recipe, it can be tempting to try to turn it into another good recipe, just by varying the ingredients. Some of those times, you may wish you’d left well enough alone. Other times you may get a dish that keeps the best of the original and embellishes it with something new. I managed to do that recently. For an upcoming dinner, I was thinking of a large piece of moist-cooked meat. 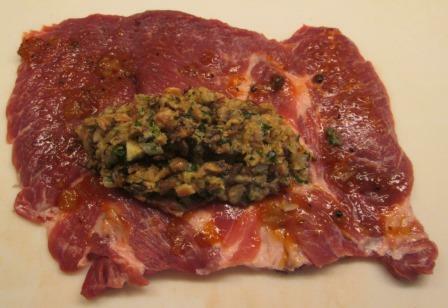 La Tavola Italiana, my first cookbook, has a very pleasant recipe for braciolone – a rolled stuffed flank steak braised in a small brown sauce – that I hadn’t revisited in years. There are dozens, maybe hundreds, of braciolone recipes, owing to the many possible variations on both meat and filling. My filling was a modest one: just small amounts of prosciutto, parsley, grated pecorino, raisins, and pignoli, with bread crumbs and raw egg to bind. 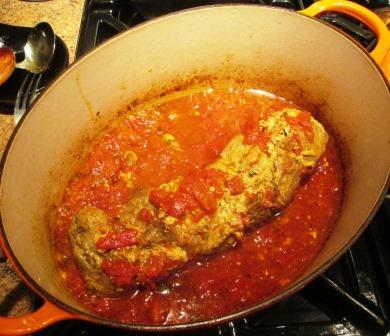 This time, I envisioned my dish as a pork roll braised in tomato sauce. 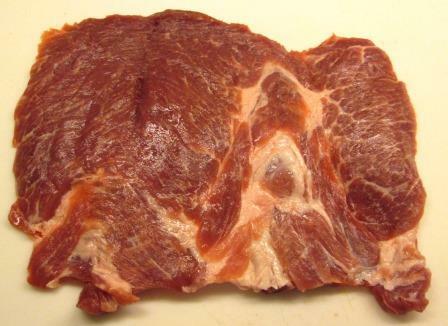 I had a nice 1½ pound piece of butterflied pork shoulder to use for it, which isn’t large as braciolone cuts usually are, but I’d be feeding only three people that evening, and it would be enough. I pounded the meat as thin as it would go. Pulling things out of the refrigerator for the stuffing, I was suddenly gobsmacked. I had no raisins or pignoli! How was that possible? I always have raisins and pignoli. But no, I’d used them up and neglected to replace them. Their sweetness and crunch are important to the dish, and it was too late to dash out to a store. What to do? Well, desperate times require desperate measures: I smeared the surface of the pork with a thin layer of Indian mango chutney. In case there might be need to mitigate that “uncanonical” flavor, I added some minced mushrooms and onion, softened in olive oil – which I had been considering using anyway – to smaller quantities of the remaining stuffing ingredients. Then I got ready to roll. I have to say I’m terrible at rolling and tying meat. If I clumsily try to wind a single piece of string around the cylinder, it never stays closed, so I have to strangle it with individual ties. Nor can I ever manage to fold in the ends of the roll so the stuffing can’t leak out during the cooking. Here I had to sew the ends closed with a darning needle and heavy thread. My braciolone wound up looking like the victim of a bad auto crash. Well, it wasn’t pretty, but neither was it the worst-looking roll I’d ever achieved. I tenderly carried it to a casserole and browned it in olive oil. Predictably, some of the stuffing immediately started to escape. Once the meat was browned I removed it to a plate, deglazed the pan with white wine, added eight peeled and chopped plum tomatoes and let them soften a bit, then returned the meat. 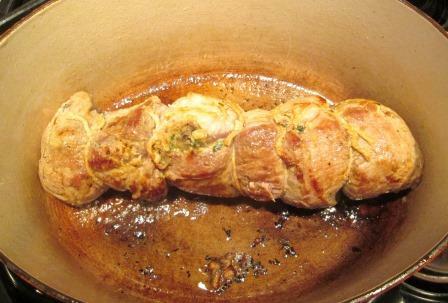 My braciole cooked covered, being turned and basted occasionally, until it was perfectly tender – about an hour and a quarter. Long before then it had been perfuming the kitchen with gorgeous aromas. The sauce was pleasantly nubbly from the escaping bits of stuffing that had merged with the tomatoes and meat juices. The meat was pretty messy to slice for serving . . .
. . . but it was excellent. All the flavors harmonized beautifully. There was a just-detectable hint of the sweet chutney spices, which complemented the natural sweetness of the pork. 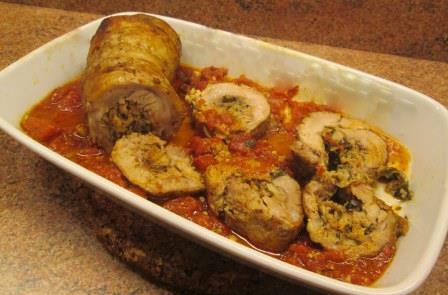 Really, pork and tomatoes love each other: The pork enriched the sauce and intensified the flavor of the now-melted tomatoes, and the tomatoes drew out even more succulence from that tender, juicy cut of pork. That’s why I always make at least a little more of this dish than we need for dinner: It’s even better the next day. Summer hasn’t quite given up yet, and the principal summer vegetables are still going strong in my greenmarket. To take advantage of this late-season bounty, I turned to James Villas’ Country Cooking, a book that has two recipes for cooked vegetable dishes designed to be served at room temperature, which I’d been meaning to try for a long time. One is for zucchini and bell peppers, the other for eggplant and onions. These are among our favorite vegetables, but except in very rare circumstances (e.g., zucchini a scapece, eggplant caviar) I only ever serve them hot. Since the book is organized around menus for entertaining, it’s easy to see how useful it is to have substantial vegetable dishes that can be entirely prepared in advance. Even without a party in prospect, I decided to make them both, in reduced quantities. This is a very lightly cooked dish, finished with a vinaigrette dressing. 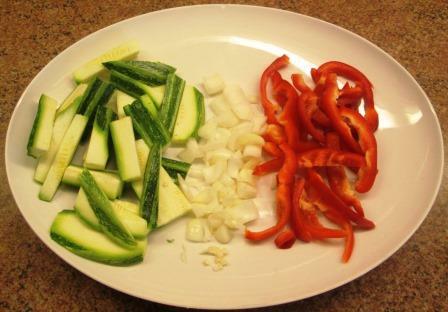 The ingredients are zucchini cut in sticks, peppers cut in strips, a little chopped onion, and a bit of garlic – staple ingredients of cooking all around the Mediterranean. They’re stir-cooked together in butter with salt, pepper, and thyme. The use of butter is a departure for me, as I – and most of the countries around the Med – typically use olive oil for these vegetables. I was curious to see what difference butter would make in the taste. As soon as the vegetables had barely softened I transferred them to a dish and, while they were still hot, tossed them with a vinaigrette of olive oil, red wine vinegar, and mustard. Then I covered the dish and refrigerated it for an hour before serving. 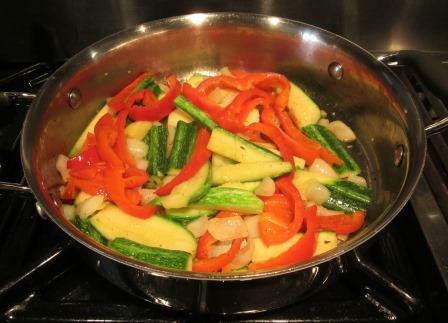 At first taste, the zucchini and peppers seemed rather bland, as if they hadn’t been affected much by either the sautéeing or the dressing. They were quite crunchy, with possibly a faint butteriness detectable under the vinaigrette flavors. As dinner went on, I came to appreciate what a good foil the vegetables made for the braised squab they accompanied, and I wound up liking them very much. Leftovers were just as good the next day. In contrast to the brief cooking time of the previous recipe, this one takes three hours – though there’s no active work in that time. 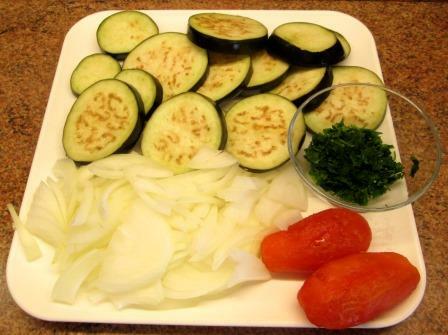 The long cooking, according to Villas, is “what gives the dish its incredibly luscious texture.” It has just a few ingredients: the eggplant, lots of onion, much parsley, a little tomato, a tad of garlic. After rinsing and drying the eggplant slices, I spread half of them in an ovenproof dish and topped them with half the parsley, all the onion, and all the tomato. I sprinkled on minced garlic, thyme, oregano, salt, pepper, and the rest of the parsley. The rest of the eggplant went on top, along with a modest coating of olive oil. Covered, the dish went into a 275° oven and baked undisturbed for two hours. At that point I was supposed to stir the mixture with a fork, cover it again, and return the pan to the oven for a third hour. I wasn’t sure how energetic a stirring was intended, and the top layer of eggplant looked so peaceful, I just nudged things around a little. Everything seemed well cooked already, but I gave it its last hour. Then it had to cool completely before being eaten. This was a very mild, mellow dish. “Incredibly luscious texture” isn’t quite the way I’d describe it, though it was pleasant enough. The eggplant (skin included) was ready to melt in the mouth. The dish had a nice onion sweetness, balanced by a slight acidity from the eggplant. A little extra salt helped bring up the flavors. As with the previous vegetable dish, this one proved to be an excellent foil for the dinner meat – in this case, grilled lamb chops. 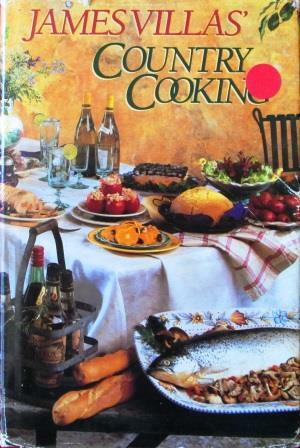 So, will I use these recipes for entertainment? I’m not sure. Years ago, when Beloved Spouse and I used to give large parties, they would have been fine. But we really don’t do that anymore. And in style, these dishes don’t fit easily into the kind of small-dinner-party menus we like to put together these days. I’m more likely to make them for ordinary home consumption. A few coincidences set the stage for a very interesting dinner at home this week. Beloved Spouse, having decided to write a post for his wine blog on a comparison between prosecco and champagne, brought home a representative bottle of each, first for a formal tasting, then to test with dinner foods. 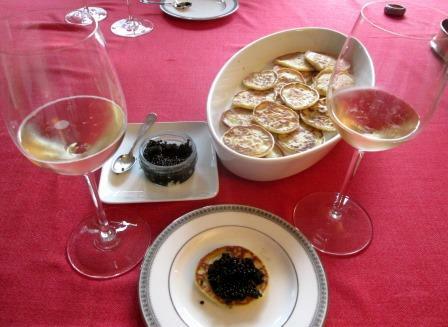 I had just read Fatal Pursuit, a detective novel by Martin Walker that has Perigord police chief/gastronome Bruno Courrèges making blinis of an unusual kind to serve with local caviar – a kind I wanted to try to make. We had a little jar of American transmontanus caviar in the refrigerator. Everyone who reads the Bruno books knows that their lavish descriptions of the hero’s cooking are virtually narrative recipes. I’ve written about re-creating some of his dishes here. 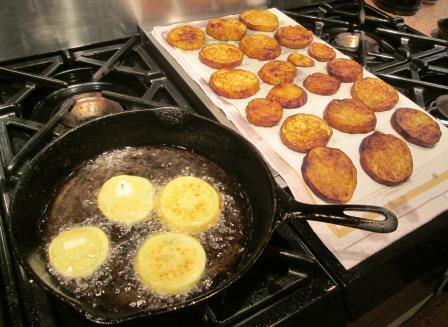 The blinis in this story are not the traditional Russian ones in several ways. Bruno uses all buckwheat flour, not a mix with white flour; he adds chopped chives to his batter of flour, milk, egg yolk, and melted butter; and – because he doesn’t have time to raise the blinis with yeast – he beats the egg white into peaks and folds it in. I did the same, but with only white flour because I had no buckwheat. I dropped the batter by tablespoonsful into very hot butter in a frying pan. (Bruno remarks that this is one of the few places he doesn’t use duck fat!) They cooked quickly and neatly, making 20 fluffy 2-inch pancakes. After we’d had the formal tasting of the sparkling wines alone, we opened our caviar and sat down to find out how the champagne and prosecco would go with our dinner dishes. 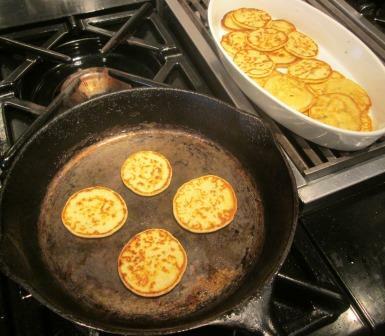 The blinis themselves were fine – light and delicate, an excellent vehicle for the caviar. I think the leftovers, which I froze, may be just as good with smoked salmon or sturgeon. 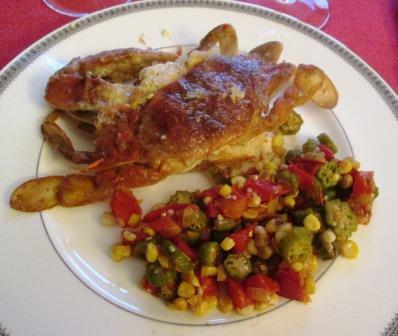 We did the same tasting of the two wines along with the dinner’s main course, which was sauteed soft-shell crabs on toast and a summer vegetable mélange of okra, corn, and tomatoes (which I’ve also written about here). I’ll leave the detailed results of the wine-wine and wine-food comparisons for Tom’s blog post to report. What I’ll say is simply that Bruno’s blinis were a success, all the food was delicious, both the wines were delightful, and the entire evening sparkled like the wine.